This year the Brisbane Architecture and Design Ideas Competition, an industry-led initiative has been rebranded to ‘4000 Ideas’ and will be supercharged with the support and sponsorship of the Brisbane City Council. Each year, a site in Brisbane is selected which becomes the focal point of the design competition. Designs and ideas by QUT and UQ Architecture students go head to head to win a top prize of $3,500. With the full backing of the Brisbane City Council, 4000 Ideas in 2018 has selected the future South Bank Metro portal site as the chosen location, specifically above the portal station entry. Situated on the corner of Grey and Melbourne Streets, the site sits within the heart of Brisbane’s cultural precinct. 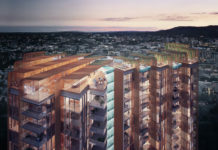 In 2016, the site was bought by Canberra-based developer Doma Group who proposed a thirty storey hotel and residential tower. 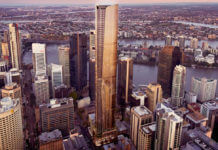 However, the site was subsequently resumed by the Brisbane City Council in order to facilitate a portal entry into the proposed new Brisbane Metro South Bank underground station. As part of Council’s Brisbane Metro, the cultural centre busway station as it stands today will be sunk underground as part of a proposed fix of the current bus bottleneck problem which is occurring when the South Eastern Busway meets traffic intersections at Melbourne Street. Last month, the Brisbane City Council created a draft Brisbane Metro plan which includes preliminary designs of a portal station entrance. While the corner site has remained a vacant parking lot, it will soon play an integral role in South Bank’s mass transit accessibility, connecting passengers to a whole range of transport destinations in South East Queensland. The 4000 Ideas Competition creators believe that the airspace above the future new mass transit station should be utilised for community benefit and accommodate something different. Competition creator Chrisney Formosa of Plus Architecture said the portal station airspace is of great significance to the cultural centre and deserves something more. “The airspace above the station portal has the potential to become a new cultural, entertainment, architectural feat or community facility of some nature”. “The competition is an opportunity for Brisbane’s budding architecture students to get innovative and apply their ideas to the city”, she said. The competition will be launched in June with an awards night to be held in late August. Details of the competition and how to enter can be found at 4000ideas.com.